Children all make up little stories around their toys, enacting whimsically childish playtime dramas on the playroom floor. And do you know what? Sometimes adults do the same thing, only their stories appear in licensed comic books, and don't make NEARLY as much sense. 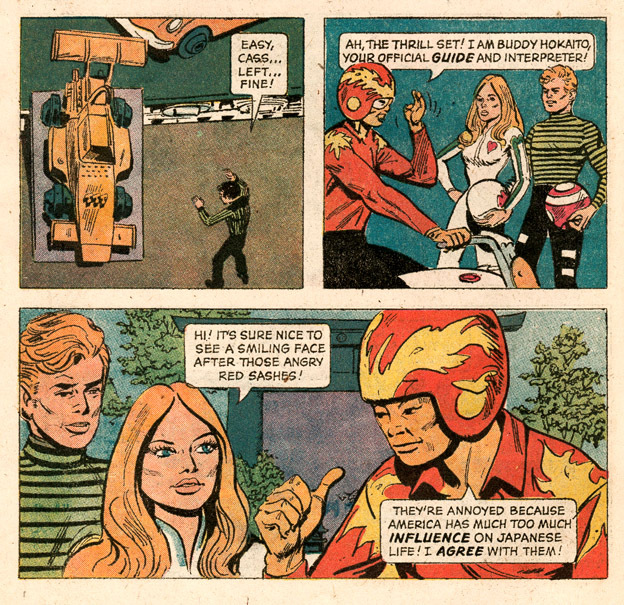 MOD WHEELS is a comic about stunt motorcyclists who visit Japan, which apparently is filled with angry Mexicans and A-frame Polynesian restaurants. Please note the pictured motorcycle which is flipping over in mid-air - you'll be seeing a LOT of this stunt. Ah, yes. 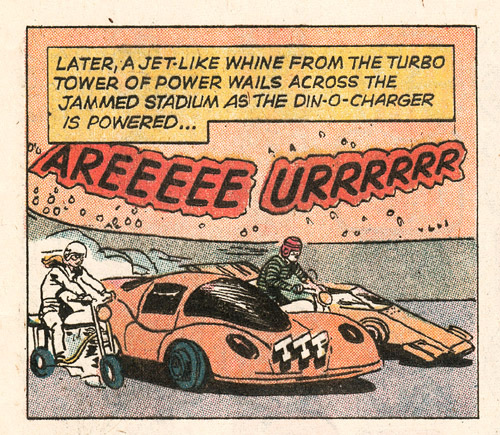 Fakey "oriental" lettering, crowds of pumpkin-colored Asians hollering at Americans for unspecified reasons, and SSP WITH ULTRA CHROME IS A TRADEMARK OF KENNER PRODUCTS. 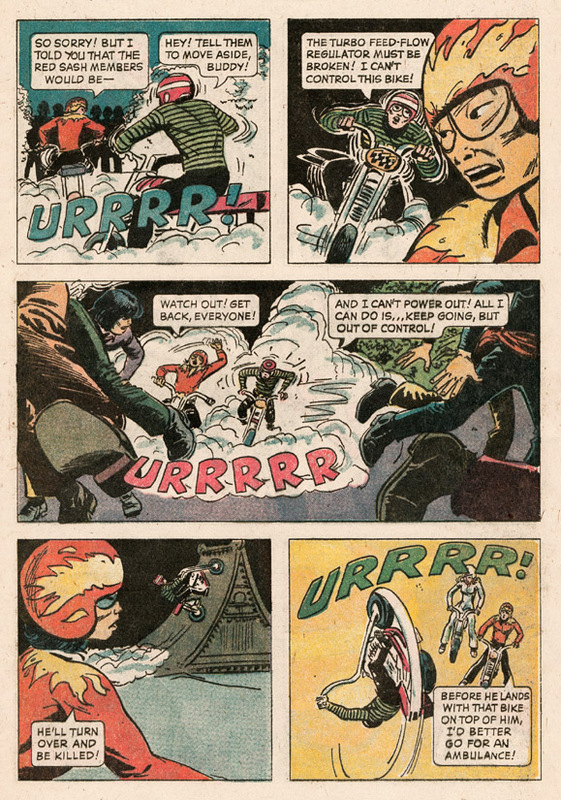 Mid 1970s licensed comic entertainment here we come! 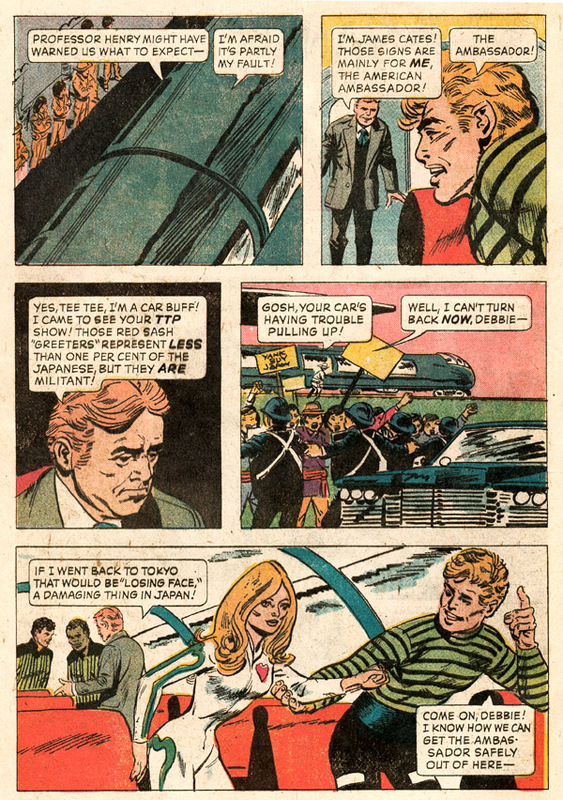 The ambassador can't get to his giant American car because of the crowds of vaguely protesting Orientals! 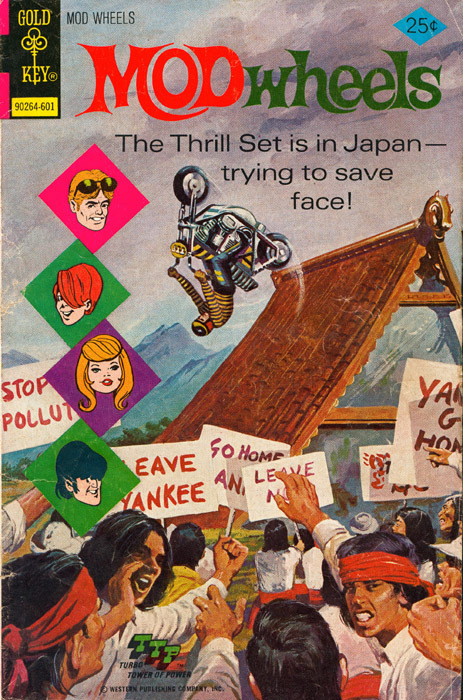 If the "Thrill Set" can't distract that crowd, American prestige will suffer the indignity of "losing face". And we all know how painful that can be. I wonder how this motor stunt team will distract the crowd. Surely they can't be thinking of staging motorcycle stunts in the middle of a crowded railway station, that's incredibly dangerous. Hey, motorcycle stunts! All right! NOTE INCREDIBLE STUNT OF FLIPPING THE BIKE FROM A RAMP. 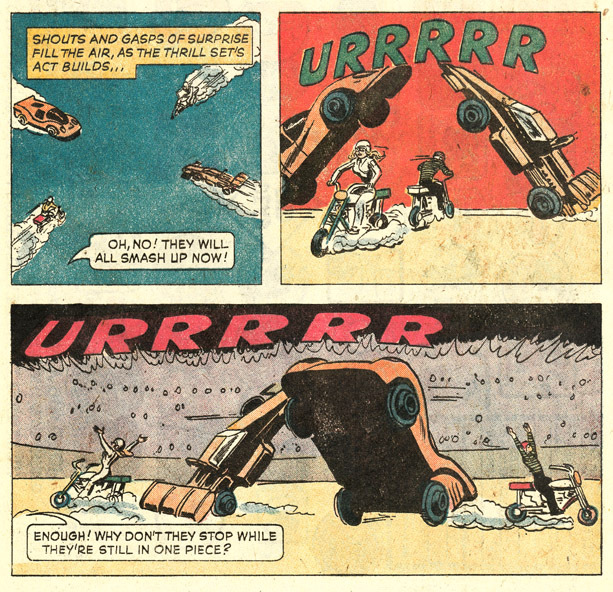 It's almost as if this comic story is trying to duplicate some sort of toy or something. 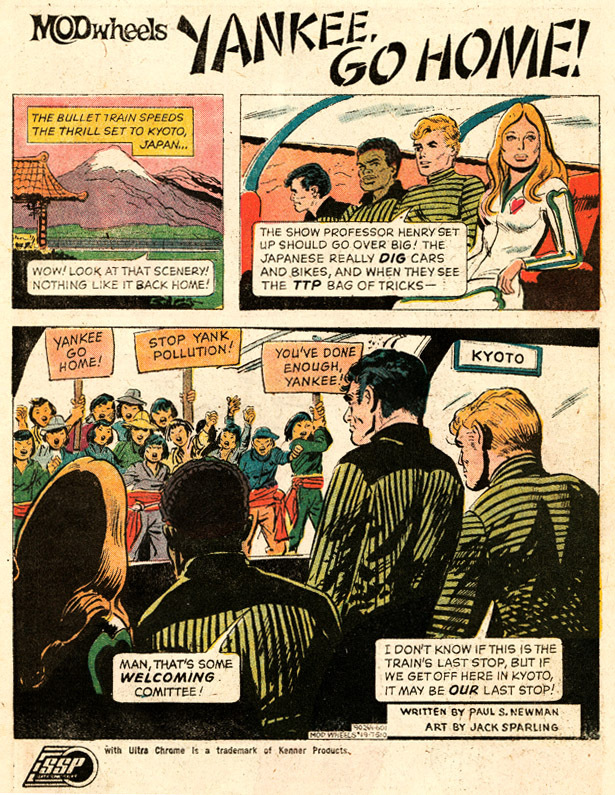 You know, "Buddy Hokaito" is right, America HAS had too much influence on Japanese life. For instance, all Japanese now appear to be clumsily-drawn racial caricatures. Not that the Caucasian characters are drawn any better. And remember that black guy on the first page? Hey, where'd he go? Oh my god I can't believe the INCREDIBLE STUNT he's doing off the side of that conveniently-placed temple roof - why it looks as if he'll just fall over on his head, but INSTEAD he FLIPS IN MID AIR! It's like something you could do at home with toys from.. what's the name of that toy company? Kenner? Yes, Kenner! And here we have the subtext of today's story, which is that Japan should focus its national intellect and effort into making complicated parts for export to America. Also Tee Tee - yes, his name is "Tee Tee" - Tee Tee here seems to be developing breasts. 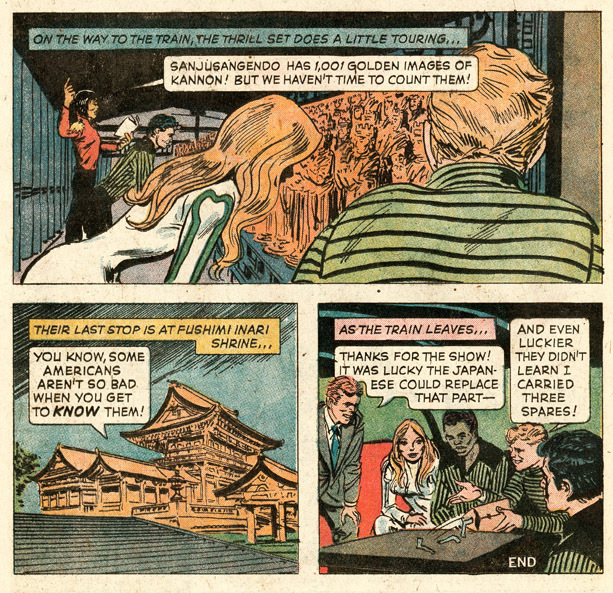 Just want to give you a good long look at this comic's sympathetic, perceptive depiction of Asians, who are drawn here to resemble lizard people from outer space. Thank you Japanese lizard men for using your technical skill to make American lives better! We await your televisions, VCRs, and fuel-efficent automobiles, not to mention your ultraviolent schoolgirl cartoons! Jet-like whines, towers of power, din-o-chargers - to me this sounds like the GREATEST ROCK CONCERT EVER. AREEEEE!! URRRRRR! I get the feeling all of the Thrill Set's shows are like this - "Oh no they will all smash up!" URRRRRR "Oh my god they totally DID NOT smash up, thereby forcing me to question all my previously held beliefs!! Thrill Set you have changed my way of thinking and I thank you!" So. 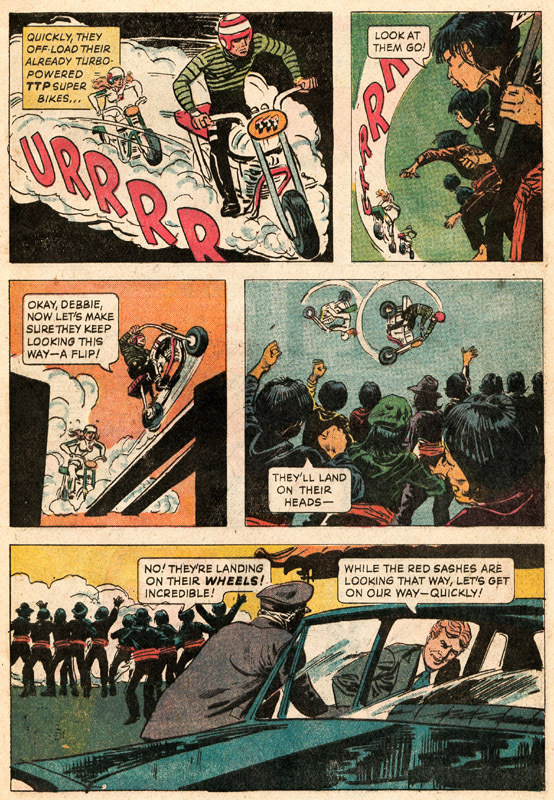 Motorcycle stunt shows bring peace and understanding between America and the land of the Lizard People. Oh yeah and we're in Japan so here are two panels of Japanese stuff we got out of the encyclopedia. Oh wait there's that black guy again. Thanks for helping out black guy! And we didn't really need the Japanese mechanics after all! IN YOUR FACE LIZARD MEN! So you're wondering what all this TTP stuff is about, right, and whether or not SSP ULTRA CHROME will really whiten your teeth and brighten your smile? Well here you go. The TTP TOWER OF POWER is a little hand pump that you connect to your bike with a little hose, and you pump and pump and pump making the little wheels of the bike go faster and faster and then you release the bike and it goes zooming down the track and then -AMAZINGLY- it goes up the ramp and does a mid-air flip. This exciting toy set also comes with a tape measure, which certainly was a key ingredient of any childhood's fun playtime. 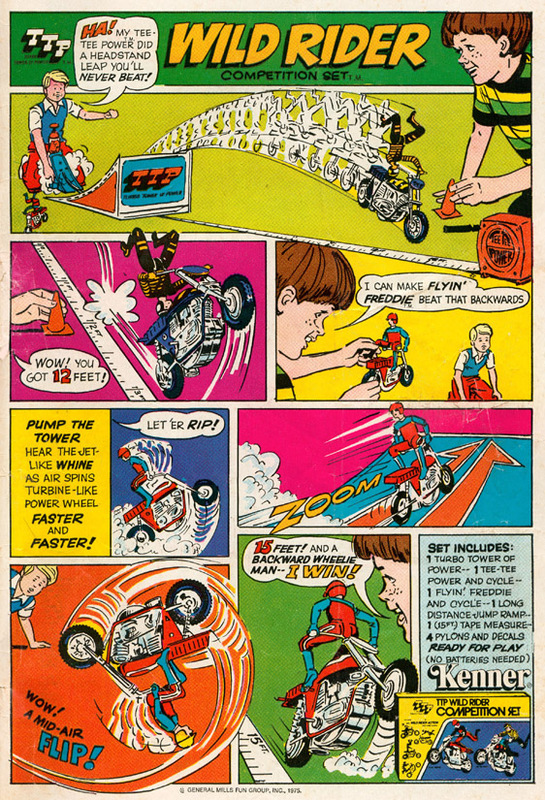 And of course you break the motorcycles and lose the cars and yet the TTP pump would lie around the family room getting tripped over for years until sometime in the mid 1980s your mom finally says "What the hell is this thing, anyway?" and throws it out. Farewell, TTP!! UUURRRRRRR! AARREEEEEEEEE!